Changzhou Kennon Electronics Co.,Ltd.is a leading manufacturer and supplier of all kinds of potentiometers, rotary switches, dimmer, trimmer potentiometers and others. The company has ISO9001, ISO14001, VDE, NEMKO, CB, CQC, ROHS, CE standards and approvals and observes for the implementation of an absolute quality control by its highly experienced specialists and engineers. Its products are widely applied in telephones, displays, car sound systems and speakers, recording devices, electronic appliances and many others. KENNON has good markets in countries from Europe, Middle East, Asia and America. List Price 2.20лв. VAT Incl. 2.10лв. VAT Incl. 1.98лв. VAT Incl. 1.88лв. VAT Incl. Potentiometer Slide, 10kOhm, 0.25W, Linear Tape, Stereo Graphite slide potentiometer linear tape stereo with resistance 10 kOhm and power 0.25 W.
List Price 5.90лв. VAT Incl. 5.57лв. VAT Incl. 5.31лв. VAT Incl. 4.98лв. VAT Incl. 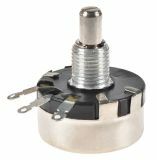 Potentiometer Slide, 10kOhm 0.25W, Logarithmic Tape, Stereo Graphite slide potentiometer logarithmic tape stereo with resistance 10 kOhm and power 0.25 W. For a technical chart see the attached file! 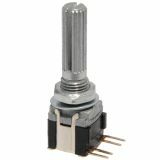 Potentiometer Slide, 10kOhm, 0.25W, Logarithmic Tаpe, Stereo Graphite slide potentiometer logarithmic tape stereo with resistance 10 kOhm and power 0.25 W. For a technical chart see the attached file! Price 4.13лв. VAT Incl. 3.92лв. VAT Incl. 3.72лв. VAT Incl. 3.49лв. VAT Incl. List Price 5.90лв. VAT Incl. 5.60лв. VAT Incl. 5.31лв. VAT Incl. 4.98лв. VAT Incl. Potentiometer Slide, 10kOhm, 0.25W, Logarithmic Tape, Stereo Graphite slide potentiometer logarithmic tape stereo with resistance 10 kOhm and power 0.25 W.
Potentiometer Linear Tape 220Ohm, Mono, Wire Wire Potentiometer Linear Tape Mono WX110 with resistance 220 Ohm, power 1 W and body dimensions Ф28 x 16.2 mm. List Price 2.90лв. VAT Incl. 2.09лв. VAT Incl. 1.98лв. VAT Incl. 1.87лв. VAT Incl.